Araceli Gutiérrez is a first generation college student and the eldest daughter of Mexican immigrant parents. She was raised in the rural and agricultural city of Arvin, in California’s Central Valley. 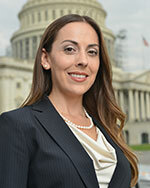 Araceli completed her undergraduate studies at San Francisco State University, earning a B.S. in business administration. Araceli received her S.M. in society, human development, and health from the Harvard School of Public Health (HSPH), with a concentration in interdisciplinary public health leadership. Prior to her graduate studies, Araceli conducted genetic and health disparities research as a SOAR-Health Scholar at the Howard University Cancer Center in Washington, D.C. Araceli also conducted a policy scan and co-authored a resource guide for the Marin Community Foundation, addressing the social determinants of health impacting underserved and immigrant communities in California’s Marin County. During her time at HSPH, Araceli was selected as a Rappaport Public Policy Fellow, and worked with Massachusetts State Representative Jeffrey Sánchez, House Chair of the Joint Committee on Public Health. The Massachusetts House recently adopted outside section provisions within its 2014 budget as a result of her research in one of Boston’s most challenged public housing developments. Araceli was also selected by the National Hispanic Medical Association as a NHMA-GE Health Professional Student Leadership & Mentoring Program Scholar for the National Hispanic Medical Association Northeast Region. As a CHCI Health Graduate Fellow, Araceli looks forward to expanding her knowledge base and experience in health policy. She is interested in examining the triangulation between public health policy, research, and the role of community in informing, developing, and adopting effective and sustainable social policies that address health disparities impacting Latinos and other minority populations.